Predator is a 1987 American science fiction action film directed by John McTiernan and written by brothers Jim and John Thomas. It stars Arnold Schwarzenegger as the leader of an elite military rescue team on a mission to save hostages in guerrilla-held territory in an unspecified country in Central America. Kevin Peter Hall co-stars as the eponymous antagonist, a technologically advanced form of extra-terrestrial life secretly stalking and hunting the team. Predator was written in 1984, under the working title of Hunter. Filming ran from March-June 1986 and creature effects were devised by Stan Winston. The film’s budget was around $15 million. 20th Century Fox released it in the United States on June 12, 1987, where it grossed $98,735,548. Initial critical reaction was mixed; criticism focused on the thin plot. In subsequent years, the general public’s attitude toward the film became positive, and it appeared on a 2015 Rolling Stone’s reader’s poll list as one of the best action films of all time. It spawned three sequels, Predator 2 (1990), Predators (2010) and The Predator (2018). A crossover with the Alien franchise produced the Alien vs. Predator films, which includes Alien vs. Predator (2004) and Aliens vs. Predator: Requiem (2007). A spacecraft flies near Earth and releases an object which enters the atmosphere. Some time later, in a Central American jungle, U.S. Army Special Forces Major Alan “Dutch” Schaefer and his elite military rescue team — Mac, Billy, Blain, Poncho, and Hawkins — are tasked by their commander with rescuing an official held hostage by insurgents. CIA agent Dillon, a former commando and an old friend of Dutch, is assigned to supervise the team, despite Dutch’s objections. The team discovers the wreckage of a helicopter and three skinned corpses, identified by Dutch as Green Berets he knew personally at Fort Bragg. Dutch’s team reaches the insurgent camp and kill the insurgents, including a Soviet intelligence officer searching through valuable documents. Confronted by Dutch, Dillon admits the mission was a setup to retrieve intelligence from captured operatives and that the dead military unit disappeared weeks earlier in a failed rescue. After capturing Anna, a guerrilla, the team proceeds to their extraction point, unaware that they are being tracked with thermal imaging by an unseen observer. Anna escapes and is chased by Hawkins, but they are ambushed by the creature. It spares Anna but kills Hawkins and drags his body away. Dutch organizes a manhunt, during which Blain is killed by the creature’s plasma weapon. Enraged, Mac initiates a firefight in which the creature is wounded, revealing luminescent green blood. The unit regroups and realizes that something in the jungle is stalking them. Dillon believes more guerrillas are responsible, but Billy is adamant that the perpetrator is not human, an assertion that is met with skepticism. The team makes camp for the night, setting traps in all directions. That night the traps are set off, and Mac kills a wild pig, mistaking it for the creature. In the confusion, the creature steals Blain’s body and Dutch realizes that their enemy uses the trees to travel. An attempt to trap the creature fails, leaving Poncho injured. Mac and Dillon pursue the alien, but it outmaneuvers and kills them. The Predator catches up with the others, killing Billy and Poncho and wounding Dutch. Realizing the creature does not target unarmed prey because there is “no sport”, Dutch sends Anna to the helicopter unarmed. The creature pursues Dutch into a river and its cloaking device malfunctions. The creature, now visible, gets within a few feet of a mud-covered Dutch. His thermal signature reduced, Dutch remains unseen by the Predator and the Predator moves on. Dutch realizes he can use mud as camouflage. While the creature collects trophies from the bodies, Dutch crafts traps and weapons and lures the creature with a war cry and fire. Dutch disables the Predator’s cloaking device and inflicts minor injuries but becomes cornered. Acknowledging Dutch as a worthy foe, the creature discards its mask and plasma weapon and engages him in hand-to-hand combat. Dutch is almost beaten, but crushes the creature under a trap’s counterweight. As the creature lies dying, Dutch asks, “What the hell are you?” The alien repeats the question in garbled English before activating a self-destruct device while laughing maniacally. Dutch takes cover just before the device explodes, resulting in a mushroom cloud. He is picked up by his commander and Anna in the helicopter. Following the release of Rocky IV, a joke circulated in Hollywood that since Rocky Balboa had run out of earthly opponents, he would have to fight an alien if a fifth film were to be made. Screenwriters Jim and John Thomas took the inspiration from the joke and wrote a screenplay based on it. The Thomas script for Predator was originally titled Hunter. The original idea, centered around the idea of “what it is to be hunted”, centered around of a band of alien hunters of various species seeking various targets, which was eventually streamlined to one extraterrestrial hunting the most dangerous species, humans, and the “most dangerous man”, a combat soldier. Additionally, the setting was chosen as Central America for having constant special forces operations during that period. The script was picked up by 20th Century Foxin 1985, and turned over to producer Joel Silver who, based on his experience with Commando, decided to turn the science fiction pulp storyline into a big-budget film. Silver enlisted his former boss Lawrence Gordon as co-producer and John McTiernan was hired as director for his first studio film. New Zealand director Geoff Murphy was also considered to direct. The original monster suit was vastly different from the final product, designed by Stan Winston, being instead a disproportionate, ungainly creature with large yellow eyes and a dog-like head, and it was nowhere near as agile as later portrayed. McTiernan consulted Winston after production became troubled. While on a plane ride to Fox studios alongside Aliens director James Cameron, Winston sketched monster ideas. Cameron suggested he had always wanted to see a creature with mandibles, which became part of the Predator’s iconic look. Silver and Gordon first approached Arnold Schwarzenegger with the lead role. To play the elite band of soldiers, both Silver and Gordon, with co-producer John Davis, searched for other larger-than-life men of action. Carl Weathers, who had been memorable as boxer Apollo Creed in the Rocky films, was their first choice to play Dillon while professional wrestler and former Navy UDT Jesse Ventura was hired for his formidable physique as Blain. Also cast were Sonny Landham and Richard Chaves and Bill Duke, who co-starred alongside Schwarzenegger in Commando. Jean-Claude Van Damme was originally cast as the Predator with the intent that the physical action star would use his martial arts skills to make the Predator an agile, ninja-like hunter. When compared to Schwarzenegger, Weathers, and Ventura — actors known for their bodybuilding regimens — it became apparent a more physically imposing man was needed to make the creature appear threatening. Additionally, it was reported that Van Damme constantly complained about the monster suit being too hot and caused him to pass out. He allegedly had also repeatedly voiced reservations about only appearing on camera in the suit. Additionally, the original design for the Predator was felt to be too cumbersome and difficult to manage in the jungle and, even with a more imposing actor, did not provoke enough fear. Van Damme was removed from the film and replaced by Kevin Peter Hall. Commitments by Schwarzenegger delayed the start of filming by several months. The delay gave Silver enough time to secure a minor rewrite from screenwriter David Peoples. Principal photography eventually began in the jungles of Palenque, Mexico, near Villahermosa, Tabasco, during the second week of March 1986, but most of the film was shot in Mismaloya, Mexico. Much of the material dealing with the unit’s deployment in the jungle was completed in a few short weeks and both Silver and Gordon were pleased by the dailies provided by McTiernan. On Friday, April 25, production halted so that Schwarzenegger could get to his wedding on time, flying to Hyannis Port in a Learjet chartered by Silver. Schwarzenegger was married on April 26, 1986, to Maria Shriver, and honeymooned for only three days while the second unit completed additional lensing. The production resumed filming on May 12 and ended in late June 1986. Both McTiernan and Schwarzenegger lost 25 pounds during the film. Schwarzenegger’s weight loss was a professional choice while McTiernan lost the weight because he avoided the food in Mexico due to health concerns. Unlike McTiernan, most of the cast and crew suffered from traveler’s diarrhea since the Mexican hotel in which they were living had problems with its water purification. In an interview, Carl Weathers said the actors would secretly wake up as early as 3:00 a.m. to work out before the day’s shooting. Weathers also stated that he would act as if his physique was naturally given to him and would work out only after the other actors were nowhere to be seen. According to Schwarzenegger, filming was physically demanding. Among other tasks, he had to swim in very cold water and spent three weeks covered in mud for the climactic battle with the alien. In addition, cast and crew endured very cold temperatures in the Mexican jungle that required heat lamps to be on all of the time. Cast and crew filmed on rough terrain that, according to the actor, was never flat, “always on a hill. We stood all day long on a hill, one leg down, one leg up. It was terrible.” Schwarzenegger also faced the challenge of working with Kevin Peter Hall, who could not see in the Predator suit. The actor recalled that “when he’s supposed to slap me around and stay far from my face, all of a sudden, whap! There is this hand with claws on it!” Hall stated in an interview that his experience on the film “wasn’t a movie, it was a survival story for all of us.” For example, in the scene where the Predator chases Dutch, the water was foul, stagnant and full of leeches. Hall could not see out of the mask and had to rehearse his scenes with it off and memorize where everything was. The outfit was difficult to wear because it was heavy and put him off-balance. R/Greenberg Associates created the film’s optical effects, including the alien’s ability to become invisible, its thermal vision point of view, its glowing blood, and the electrical spark effects. The invisibility effect was achieved by having someone wearing a bright red suit (because it was the farthest opposite of the green of the jungle and the blue of the sky) the size of the Predator. The red was removed with chroma key techniques, leaving an empty area. The take was then repeated without the actors using a 30% wider lens on the camera. When the two takes were combined optically, the jungle from the second take filled in the empty area. Because the second take was filmed with a wider lens, a vague outline of the alien could be seen with the background scenery bending around its shape. For the thermal vision, infrared film could not be used because it did not register in the range of body temperature wavelengths. The filmmakers used a Inframetrics thermal video scanner because it gave good heat images of objects and people. The glowing blood was achieved by green liquid from glow sticks mixed with personal lubricant for texture. The electrical sparks were rotoscoped animation using white paper pins registered on portable light tables to black-and-white prints of the film frames. The drawings were composited by the optical crew for the finished effects. Additional visual effects, mainly for the opening title sequence of the Predator arriving on Earth, were supplied by Dream Quest Images (later Oscar-winners for their work on The Abyss and Total Recall). The film was nominated for an Academy Award for Best Visual Effects. The score was composed by Alan Silvestri, who was coming off the huge success of Back to the Future in 1985. Predator was his first major action movie and the score is full of his familiar genre characteristics: heavy horn blasts, staccato string rhythms, and undulating timpani rolls that highlight the action and suspense. Little Richard‘s song “Long Tall Sally” is featured in the helicopter en route to the jungle. Mac also recites a few lines from the song as he’s chasing the Predator after it escapes from their booby trap. Silvestri returned for the sequel, making him the only composer to have scored more than one film in either the Alien or Predator series. In 2003, Varèse Sarabande released the soundtrack album as part of its limited release CD Club collection; the album also includes the Elliot Goldenthal arrangement of the Fox fanfare used on Alien 3. In 2010, the same year Predators featured an adaptation of Silvestri’s score by John Debney, Intrada Records released the album in a 3000-copy limited edition with remastered sound, many cues combined and renamed, and most notably (as with Intrada’s release of Basil Poledouris‘s score for RoboCop) presenting the original end credits music as recorded (the film versions are mixed differently). This release is notable for having sold out within a day. Released on June 12, 1987, Predator was #1 at the US box office in its opening weekend with a gross of $12 million, which was second to only Beverly Hills Cop II for the calendar year 1987. The film grossed $98,267,558, of which $59,735,548 was from the US & Canadian box office. $38,532,010 was made overseas. Rotten Tomatoes, a review aggregator, reports that 80% of 44 surveyed critics gave the film a positive review, with an average rating of 7/10. The site’s critical consensus reads: “Predator: Part sci-fi, part horror, part action—all muscle.” Audiences polled by CinemaScore gave the film an average grade of “B+” on an A+ to F scale. In subsequent years, the film’s critical response has been more positive and as a result Predator has appeared on a number of “best of” lists. In 2001, it was one of 400 films nominated for the American Film Institute‘s “100 Years… 100 Thrills” list, though it did not place in the top 100. In 2003, the Predator creature was one of 400 characters nominated for AFI’s 100 Years… 100 Heroes and Villains. 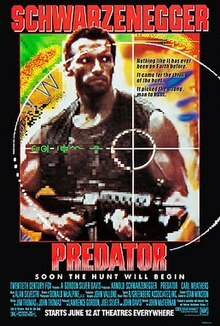 In 2007, C. Robert Cargill of Film.com ranked Predator as the seventh best film of 1987, calling it “one of the great science fiction horror films, often imitated, but never properly duplicated, not even by its own sequel.” Entertainment Weeklynamed it the 22nd greatest action movie of all time in 2007, and the 14th among “The Best Rock-’em, Sock-’em Movies of the Past 25 Years” in 2009, saying “Arnold Schwarzenegger has never been as manly as he was in this alien-hunting testosterone-fest.” IGN proclaimed it the 13th greatest action movie of all time. In 2008, Empire magazine ranked it 336th on their list of “The 500 Greatest Movies of All Time”. In 2013, NECA released action figure collectables of Major Dutch and the Predator, marketed as “Jungle Hunter Dutch Schaefer”, “Jungle Disguise Dutch Schaefer”, “Jungle Extraction Dutch Schaefer”, “Jungle Patrol Dutch Schaefer”, “Jungle Hunter Predator”, “Water Emergence Predator”, and “Cloaked Classic Predator.” That same year, Predator was converted into 3D for Blu-ray release. The Predator even makes an appearance in Tom Clancy’s Ghost Recon: Wildlands, in a bonus mission called “The Hunt”. The line “Get to the choppa” was subsequently associated to Arnold Schwarzenegger, especially when Schwarzenegger said the line again in some of his later appearances, including The New Celebrity Apprentice and advertisements for the mobile video game Mobile Strike. Predator was released on DVD on August 10, 2004, The film was later released on Blu-Ray on April 15, 2008. Predator was released on Blu-Ray 3D on December 17, 2013. Predator was released on 4K UHD Blu-Ray on August 7, 2018. The success of Predator led 20th Century Fox to finance three direct sequels over the next thirty one years, each by different directors, starting with Predator 2, was released in 1990. Arnold Schwarzenegger hasn’t reprised his role as Dutch in the subsequent sequels. The success of Predator resulted in the creation of a media franchise with numerous novels, comic books, video games, toys, and other media and merchandise appearing over the years. A number of these began appearing under the Alien vs. Predator crossover imprint, which brought the Alien creatures together with the eponymous characters of the Alien franchise. A film series followed, with Alien vs. Predator in 2004, and Aliens vs. Predator: Requiem in 2007. Jump up^ The film and its sequel Predator 2 only confine the setting to Central America while the novelization of the first film is set in the fictional country of Val Verde. The later film Predators states the events of the first film occurred in the Central American country of Guatemala. Jump up^ Dutch’s full name is never given in the film although the script, novelization, and some merchandise give his name as Alan “Dutch” Schaefer. Jump up^ “PREDATOR”. British Board of Film Classification. Retrieved December 15, 2014. ^ Jump up to:a b “Predator (1987)”. Box Office Mojo. Retrieved July 4, 2014. ^ Jump up to:a b “Predator – Box Office Data, DVD and Blu-ray Sales, Movie News, Cast and Crew Information”. The Numbers. Retrieved December 15,2014. Jump up^ Johnston, Keith M. (2013). Science Fiction Film: A Critical Introduction. Berg Publishers. p. 98. ISBN 9780857850560. ^ Jump up to:a b c d e f Haufrect, Ian T. (2001). If It Bleeds, We Can Kill It. PredatorDVD: 20th Century Fox. Jump up^ Jim & John Thomas (2005). Writers Commentary track. Predator 2DVD: 20th Century Fox. Jump up^ “Roy Murphy: Geoff Murphy interview”. Murphyroy.com. Retrieved 2011-07-19. Jump up^ “When Jean-Claude Van Damme played Predator”. Retrieved 2015-04-30. Jump up^ Don’t Drink The Water. Predator Special Edition, Disk 2: 20th Century Fox Home Video. 2001. ^ Jump up to:a b c Gire, Dan (December 1987). “Schwarzenegger on Predator“. Cinefantastique. ^ Jump up to:a b c Gire, Dan (December 1987). “Predator: The Man in the Suit”. Cinefantastique. ^ Jump up to:a b c d e Robley, Les Paul (December 1987). “Predator: Special Visual Effects”. Cinefantastique. Jump up^ “Predator: Award Wins and Nominations”. IMDb.com. Retrieved July 18, 2010. Jump up^ “Filmtracks: Predator (Alan Silvestri)”. Jump up^ “1987 Domestic Grosses”. Box Office Mojo. Retrieved 2008-01-30. Jump up^ “Predator (1987)”. Box Office Mojo. Retrieved 2008-01-30. Jump up^ “Predator Reviews”. Metacritic. CBS Interactive. Retrieved May 13,2018. Jump up^ Mitchell, Elvis (June 12, 1987). “The New York Times Review: Predator“. The New York Times. p. C6. Jump up^ Lamanna, Dean (1987). 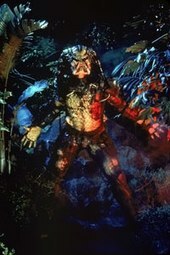 “Predator: Scoring the hunt” (18/1). Cinefantastique: 36. Jump up^ “Predator Review”. Variety. January 1, 1987. Retrieved May 4,2009. Jump up^ Wilmington, Michael (June 12, 1987). “Los Angeles Times“. Los Angeles Times. p. 6. Jump up^ Ebert, Roger (June 12, 1987). “Predator“. Chicago Sun-Times. Retrieved January 30, 2008. Jump up^ Barker, Adam (1988). “Predator”. Monthly Film Bulletin. London: British Film Institute. 55 (648): 19–20. Jump up^ “Predator (1987)”. Rotten Tomatoes. Fandango. Retrieved May 13,2018. Jump up^ “AFI’s 100 Years… 100 Thrills: America’s Most Heart-Pounding Movies” (PDF). American Film Institute. Retrieved July 18, 2010. Jump up^ “AFI’s 100 Years… 100 Heroes and Villains” (PDF). American Film Institute. Retrieved July 18, 2010. Jump up^ Cargill, C. Robert (August 2, 2007). “The 10 Best Movies of 1987”. Film.com. Retrieved April 23, 2010. Jump up^ Bernardin, Marc (June 18, 2007). “The 25 Greatest Action Films Ever!”. Entertainment Weekly. Retrieved January 30, 2008. Jump up^ Bernardin, Marc (January 30, 2009). “The Action 25 Films: The Best Rock-’em, Sock-’em Movies of the Past 25 Years”. Entertainment Weekly. Retrieved July 18, 2010. Jump up^ “The Top 25 Action Movies”. IGN. 2012. Retrieved August 9, 2012. Jump up^ “The 500 Greatest Movies of All Time”. Empire. 2008. Retrieved July 18, 2010. Jump up^ “Predator on 3D Blu-ray comes loaded with awesome extras”. Retrieved January 16, 2018. Jump up^ Weisman, Aly (April 29, 2014). “How Arnold Schwarzenegger’s ‘Get To The Choppa!’ Movie Quote Became So Popular”. Business Insider. Retrieved February 6, 2017. Jump up^ Jagannathan, Meera (January 3, 2017). “Arnold unveils lame new ‘Celebrity Apprentice’ catchphrase”. NY Daily News. Retrieved February 6, 2017. Jump up^ Ross, Dalton (3 January 2017). “‘The New Celebrity Apprentice’ season 8 premiere recap: ‘In Here You Call Me Governor‘“. EW.com. Retrieved 6 February 2017. Jump up^ Grubb, Jeff (5 February 2017). “Mobile Strike’s $5 million Super Bowl ad has Arnold Schwarzenegger rehashing his famous one-liners”. VentureBeat. Retrieved 6 February 2017. Jump up^ “Predator DVD Release Date”. DVDs Release Dates. Retrieved 2018-06-20. Jump up^ “High Def Digest | Blu-ray and Games News and Reviews in High Definition”. ultrahd.highdefdigest.com. Retrieved 2018-06-20.